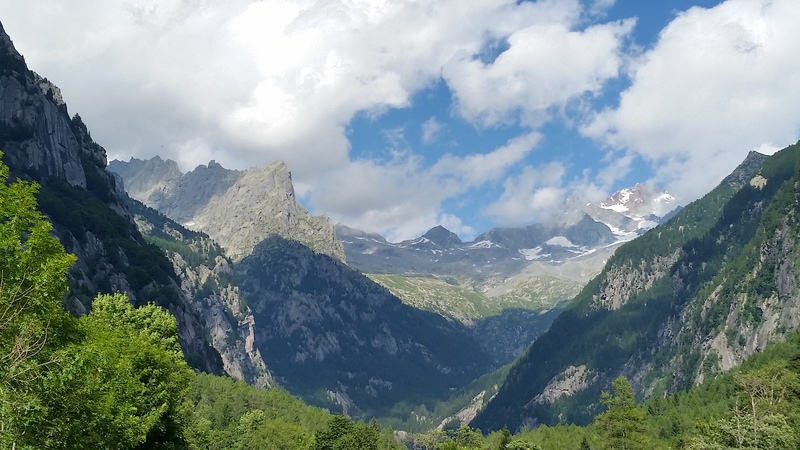 Val di Mello has been likened to a European Yosemite Valley, but it isn’t really a fair comparison. Whilst VdM has cliffs that are almost as high, they’re broken up by tree filled ravines and ledges, trading off the sheer scale of El Cap for a prettier but more jumbled set of still very impressive crags, set in a more alpine setting. Anyway, it’s a lovely place. It also has something for everyone – bouldering is really big here, with the annual MelloBlocco festival seeing 2,000 plus Pad-totting boulderers arriving each year. There’s also some sports climbing and some major Big Walls (up to 27 pitches on Monte Quality) . There are also a guidebook-full of major trad climbs, which were really what originally put Val di Mello on the map. 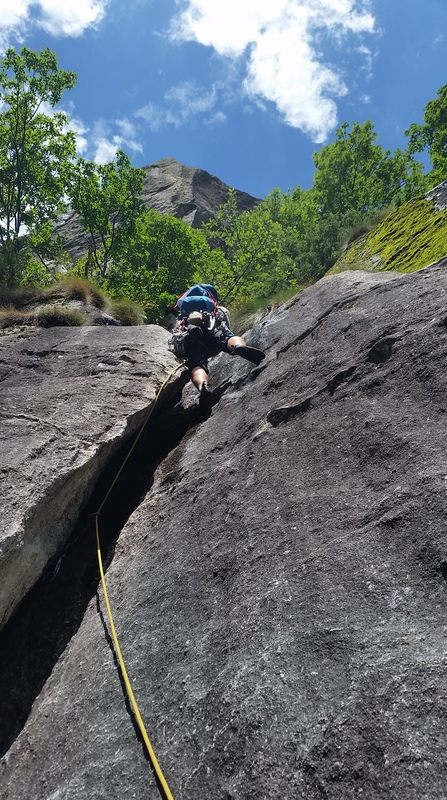 Two of these, Il Risveglio di Kundalini and Luna Nascente have recently been voted amongst Europe’s top 10 multi pitch routes, and it was this pair that were our main objectives for this part of the trip. Stacked one above the other and each around 10 pitches and 400m of E1/E2 they can be linked into a huge day out. We’d (or maybe I’d…) contemplated this but poor weather and good sense intervened. With a forecast of a possible storm at 2pm we planned for an early start on Kundalini. This takes about four pitches to reach the huge curving roof which it then traverses under for about 100m before breaking through the right hand end and making a bid for the huge halfway ledge / forest. See below – the roof is visible about halfway up the left hand end of the lower crag. All was going well until we ground to a halt at the off width pitch 4 which was streaming with water. Protected only by a big cam at the base, you’d be looking at a 20m fall if your foot slipped whilst smearing on the black ooze at the top and I decided it wasn’t a risk worth taking. Happily, by now we’d been caught up by a couple of strong Hungarian climbers (Zoli and Benni) and we beckoned them through. Zoli despatched the chimney with style and Benni kindly took our rope up – a first such rescue in 35 years of climbing! You can’t really see how wet the wall is on the picture above – honest, it was streaming! Not much bother with the reassurance of a top rope and we were soon another 100m up and underneath the roof where the route traverses right. I’d imagined our Hungarian friends would be out of sight but I arrived to find a bit of a log jam. More major wetness! The Hungarians solved the problem with a bit of tensioning and a pendulum, whilst I broke open the magic box of El Cap tricks and soon followed via a full blown aid extravaganza. … and we could start heading upwards again – anxiously checking the sky for signs of a deluge as it was now storm o’clock. Luckily we just got a few drops and managed to top out with a final climactic 60m pitch up the right arête of the crag. A bit over 5 hours seemed reasonably respectable, given the conditions. With a better forecast for the next day we decided to stash our gear at the bottom of Luna before heading down for a well earned beer at the Gatto Rosso.